At the center of the galaxy is a ring of dust that is believed to harbor a black hole. This ring is almost perpendicular to almost flat spiral arms of M51, which makes it look like a top spinning on the floor. In addition to the main ring, a second ring of dust was discovered circling the galaxy. 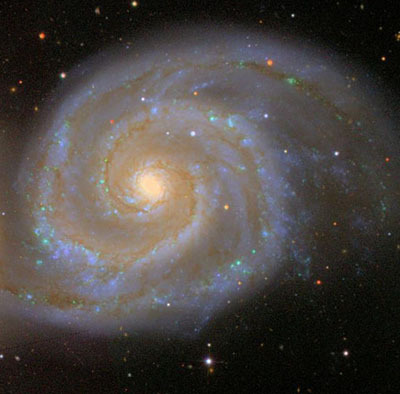 The whirlpool effect is believed to be caused by a collision of the whirlpool galaxy with its companion. The cosmic dust surrounding the galaxy consists mainly of a variety of carbon-based organic molecules called polycyclic aromatic hydrocarbons. A star which exploded inside the galaxy in 1994 gave the best images of a supernova to date, and allowed to determine the chemical composition of the galaxy. This galaxy is often believed to contain regions of star formation, however, no one has seen a star form yet, since it would take hundreds of years to form a star. This assumption is made based on the theory that stars form from dust surrounding the galaxy, but modern astronomy simply hasn't been around long enough to observe star formation from start to finish.